For their first birthday celebrations, Blasta have launched a new beer, with owner Steve Russell deciding to make it a special beer. 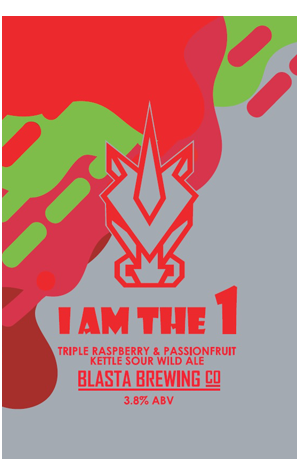 Aptly named I Am The 1, it features more than 300kg of raspberries and the same amount of passionfruit, with the result a vibrant and very distinct bright red colour. The aromas of freshly picked raspberries and more subtle passionfruit puree invite you to take a large swig, which leads to flavours of fresh raspberries and tropical passionfruit complemented by a nicely balanced tartness and acidity from the kettle souring. There's a zippy effervescence at play too, with minimal bitterness making this a beautifully thirst-quenching birthday offering.